Outlaw Ministries at Brushy Creek Ranch has become a ministry like no other! On Easter 2016, there were no vacancies as the ranch was filled with guests who had traveled from all parts of the south. We planned to hold a first-time church service for those who were interested and that morning, it became a torrential downpour. We tossed around the idea of canceling the service due to it needing to be outside under the pavilion. The chances of getting everyone soaked was very high! Something struck a chord with us and we quickly looked around at how blessed we were to have this beautiful piece of property to share with some really great people. As Christians, we knew our God was not a fair-weather God. At that moment, we knew we could not be fair-weather Christians. We packed everyone in a small bunkhouse, cranked up some music, and we had church. One year later, we began construction on a chapel. We had no budget, no building plan, very limited help, but a whole lot of faith! We prayed over this project and materials began to be donated left and right. Businesses were donating rough cut lumber, others donating screws, nails, etc. We have been blessed to have the men of the church band together and get the chapel completed. It took approximately 15 months. We faced many obstacles but knew God wanted this chapel to be built. The pace was slow and steady. There was a wedding booked mid-November of 2017 so we did, in fact, have a deadline to meet for a beautiful bride! We will forever be grateful for this wedding, as it pushed the completion of the most special little building we’ve ever built. Outlaw Ministries focuses on truth. For so many years, we have been taught to think what others tell us to think. Rarely do we read the Bible for ourselves and figure out what it’s really saying. The first year of Cowboy Church was primarily focused on teaching the true personality of Jesus Christ. Often times, many people have a misconstrued image of our savior. As we study the Bible, we see the true and raw personality of Him and his disciples. As our church learns about these heroes, it enhances our faith and the ability to teach others that may be struggling with a life full of ups and downs. We learn that the disciples were just as common as we are. We also learn the Jesus portrayed the characteristics of a holy and righteous outlaw. He was confrontational, he was raw, and he was full of personality that we often miss. 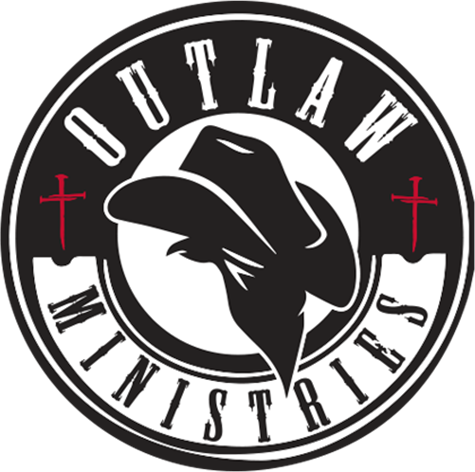 Our mission at Outlaw Ministries is to, first and foremost, teach people about the gospel and take as many as we can to Heaven. A part of our desire is to study with people individually. We host a Bible study every Wednesday evening at the ranch. We eat together at 6:30pm and begin Bible study at 7pm. There is a lot of history in the Bible and when you have people guiding your study that implements the history and true personality of Jesus Christ...it makes it so fun to read! Have you ever read the Bible and laughed? We do on a weekly basis! We are seeing Jesus’ humor shine through many of these stories. What can you expect on a Sunday morning at Cowboy Church? You may very well hear some Chris Stapleton or bluegrass as you are greeted by some of the most loving and outgoing people you’ve ever met! You’ll hear spurs jingling on the back of cowboy boots as high heels would seep through the cracks of the wooden floor. Our cowboys and cowgirls come dressed as they are with plans to ride soon after! When you open the sliding barn doors in the front, there’s no doubt you will smell hot homemade biscuits and gravy and the coffee pot will be going strong. You’ll see benches made from cedar trees, a leather couch, a church pew that my late grandfather sat in every week for as long as my soul can remember, and hay bales in the front. You’ll find no fancy podium for a preacher. You will see a broken saddle on a saddle rack, with a cowboy in a black hat standing behind it. To the far right corner, you’ll see a large cross that was hand built by a church member. On the back center wall, you’ll find an elk skull killed by one of our leaders in Colorado with a sign below that says “Saddle up your horses.” Upon arrival, you can make yourself at home in a rocking chair on the front porch as we wait for everyone to gather around. When 9am comes, you’ll hear a familiar rodeo announcer voice from the one and only, Mr. Robbie Bass. Following his introductions, we often have some beautiful voices that sing songs of praise and worship, with a little country twist. Our messages at Outlaw Ministries are bold, truthful, and hold no punches. We associate ourselves with no religion or denomination. We solely focus on being Christians that love and share God’s word. Our mission is to teach people how to get to Heaven through the 5 apparent steps of salvation. Not many Sundays go by that we don’t baptize anyone in the cold Brushy Creek that sits right behind our chapel. Even though the winter with snow on the ground, there was no stopping those that wanted to be born again. We know God watches over this ministry, as He has shown us time and time again that we are on the path of righteousness. We invite you to join us anytime you can. We promise you’ll leave full…..spiritually and physically. The men will be surrounded and welcomed by our Wild Men and the women will be surrounded and welcomed by our Rearing Women. There just isn’t anything like it. If you are tired of being judged, tired of feeling empty, tired of feeling stagnant, or if you just need to study, or know anyone in need, please send them our direction. We would love to shower them with Outlaw love and read the words written in the only book that has stood the test of time…..the Bible. CONFESS: Romans 10:9 “That if you confess with your mouth “Jesus is Lord” and believe in your heart that God raised him from the dead, you will be saved. For it is with your heart that you believe and are justified, and it is with your mouth that you confess and are saved.